Great coleslaw recipe which is ideal for those trying to incorporate more Apple Cider Vinegar into their diets. A mandolin makes shredding cabbage for slaw very easy. This salad makes a major contribution to 5+ a day. 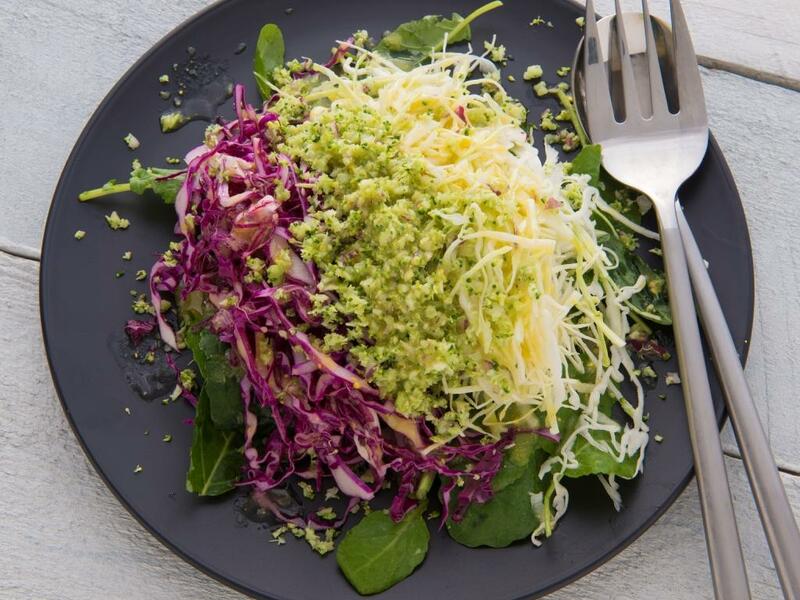 Use the dressing on other salad combinations. Dressing: Crush and peel the garlic. Place in a screw top jar with the vinegar, mustard, oil and salt. Shake well to combine. Mix one third of the dressing with the red cabbage and another third with the green cabbage. Peel the onion and chop roughly. Place in a food processor with the broccoli and chop finely. Mix in half of the remaining dressing. Place the kale on a serving plate. Arrange the cabbages and broccoli mixture on top. Drizzle over the remaining dressing.